World Book Night 2012 – Almost There! 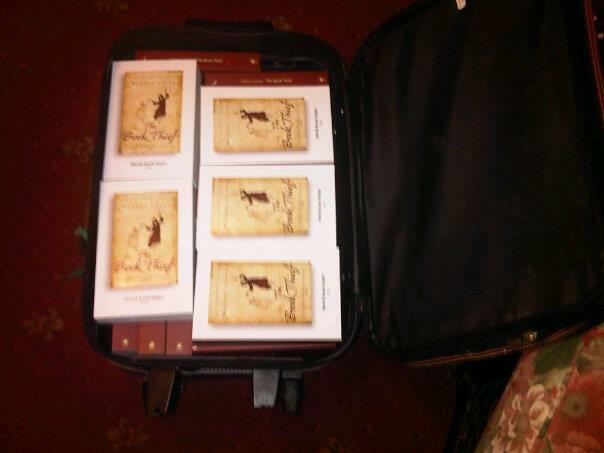 What you see above is a suitcase full of World Book Night books, ready to be given out! Yes, folks, I collected my 24 copies of The Book Thief from Waterstone’s at the Trafford Centre on Tuesday night and I was writing the required information in the “book plate” pages on Wednesday. At the front of each copy of a World Book Night special edition book, there is a book plate page in which the Book Giver, myself for example, has to write the following: Firstly, their name, then where they collected the book from. In this case, “Waterstone’s, Trafford Centre”. Then I had to write one of the 24 unique identifying numbers which I had been allocated for my books, so I was ticking them off on my printed-out email. Can’t quite believe that it’s almost upon us and that I have been chosen as a book giver! I first blogged about World Book Night 2012 in a blog entry on 5th July last year, so here we are just over 9 months later and I’m blogging about how it’s soon come around and I will be spending the evening of my 39th birthday going round the Trafford Centre with a suitcase full of books to give out to those who are light readers and may require a free book to get them going on the book front! There are 25 different books being given out for World Book Night. I imagine that for the first WBN last year, a panel of literary bods chose the books, but this time round, thousands of bookworms have helped to determine which books would make it into the Top 25 for Book Givers to hand out by registering with the World Book Night website and voting for books they love. The 25 books with the most votes would make the cut. Indeed, The Book Thief, my chosen book, finished 3rd! Not sure which book came 2nd but I’m pretty sure Pride And Prejudice topped the voting. That was one of my set texts for GCSE English Literature at high school! The 25 books cover a broad range of reading tastes and while some books such as Pride And Prejudice and A Tale Of Two Cities were published years ago, some of the others are very recent publications from the last year or so, such as Room by Emma Donoghue. Other notable books on the list, as far as I’m concerned, are The Alchemist by Paulo Coelho which I read and enjoyed and the excellent and utterly hilarious Notes From A Small Island by Bill Bryson which was, I think, my 2nd choice to give out. The Damned United by David Peace is also on the list. I have the book, but haven’t read it yet. I have, however, seen the film which was made, loosely based on the book, detailing Brian Clough’s very short time (44 days, I think) as manager of Leeds United. For those of us who harbour an immense dislike of that club, it is an excellent film as Leeds were utterly crap under Cloughie and kept losing, so it’s most amusing indeed for a Manchester United fan like myself! While I’m on the subject of football-related books, I dug out my copy of Odd Man Out: A Player’s Diary by Brian McClair the other day as I’d been messaging with one of my fellow Reds on Facebook – she’d been giving a few quiz questions on a United-related group on FB and one of them was about McClair and his nickname Choccy, which I correctly said was because it was choccy as in chocolate eclair due to it rhyming with McClair! Choccy scored the 2nd goal in the first match I ever went to! Denis Irwin scored the first and Ryan Giggs the third as we beat Norwich City 3-0 on 7th September 1991 at Old Trafford. Also, while we’re on the subject of football books, I have just bought myself Chris Kamara’s autobiography, Mr Unbelievable. The subtitle of this book is: Fighting Like Beavers on the Front Line of Football! I am a huge fan of Soccer Saturday on Sky Sports News. I already have Jeff Stelling’s book, Jelleyman’s Thrown A Wobbly, but I have lent it out to someone else at the moment. My sister, I think. For those who are also fans of Soccer Saturday, and I know there are many likeminded people out there, you might also enjoy How Not To Be A Professional Footballer by Paul Merson, former Arsenal midfielder and regular Soccer Saturday panellist. Not a SS panellist, but definitely of the Gooner persuasion is Nick Hornby and I can’t really mention football books I have loved without mentioning Fever Pitch, can I?! I absolutely laughed my head off reading that book! Back to World Book Night for a moment and at the back of each special edition is an extract from another book. These are chosen by the authors (or sometimes the publishers or estate of the author if the author is deceased) and they think the reader might like this book if they’ve enjoyed the book they’ve just finished. At the end of The Book Thief, there is an extract from a novel called Jasper Jones by Craig Silvey. Returning to the main novel itself, though, one of my favourite parts of The Book Thief is when the 1936 Olympics are on in Berlin and Liesel’s friend, Rudy Steiner, makes himself black with charcoal in an effort to emulate his new-found athletic hero, US sprinter Jesse Owens! Anyone who wants to know more about those particular Games would be advised to read Hitler’s Olympics: The 1936 Berlin Olympic Games by Christopher Hilton. However, I have a big book about the Olympics that my parents bought me as either a birthday or Christmas present years ago, and it was from that book that I found out that Mr Owens’ name was actually James Cleveland Owens. However, due to the way he said J C quickly, it came out sounding like Jesse, and thus the name Jesse stuck and he became known as Jesse Owens! For the record, his four gold medals in Berlin came in the 100m, 200m, long jump and the 4 x 100m relay. 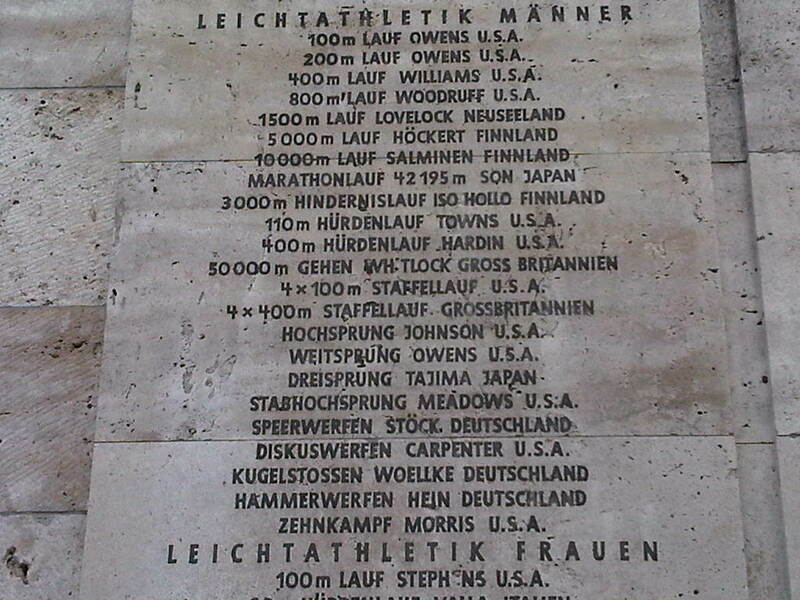 There are plaques on the walls at the bell-tower end of the Olympic Stadium in Berlin listing all the Olympic Champions from 1936. I saw them when I visited the stadium in February. Honours Boards at the Olympic Stadium, Berlin. Given that the Olympics are on in London this summer, prepare yourselves for more Olympic-related books, fiction and non-fiction alike, in the coming months! In the meantime, this decidedly unathletic bookworm really ought to give some serious thought to clocking up some Zs for the night, so it’s time to bring this blog to an end and wish you all goodnight for now. Take care and Happy Reading! I usually say good evening, but I can’t really claim that it is a particularly good one for me right now as my maternal grandad passed away this morning, aged 91, having been ill for the past 3 weeks. Strange thing is, though, that I’ve felt reasonably OK today. I was more upset before he died, particularly in the previous two or three days, and especially when I downloaded some e-books about grief, loss and bereavement on my Kindle. Feeling that I needed that kind of reading matter made me cry. I think, though, that seeing my grandad in very poor health was the really upsetting thing. I saw him for the final time last night, still alive and just about awake as I wished him goodnight before leaving my grandparents’ home, so I guess he went back to sleep and just didn’t wake up this morning. Now his pain and discomfort is over and he can rest in peace and I can remember him as the younger, gardening Grandad that he was before he turned 80 in late 2000 and the arthritis started. Now, I know what some of you bookworms might be thinking – that I’ll do a Nina Sankovitch, but my commitments, particularly my full-time job, mean that doing what she did in reading a book a day for an entire year is pretty much out of the question in my case. Bit of a shame, but I still see myself as taking comfort in reading as much as I can get read, even if it’s not to the extent of doing as Nina did in Tolstoy And The Purple Chair. I might dig that book out again and re-read it though. She had her year of reading following the death of her sister, who was a fellow bookworm. I often saw Grandad reading a newspaper, either the Manchester Evening News or the Daily Express, but I don’t actually remember him reading books. Not to say he didn’t, but I just remember him reading newspapers, mostly. I’d started typing this blog entry and have only just thought of a title for it. It’s hard enough typing tonight, but finding a title for tonight’s entry was proving harder. I nearly considered Life, Death and Books, but as I said my grandad tended to read newspapers when I saw him reading, I couldn’t really just say books on this occasion and, so far in this blog, I’ve only actually mentioned one book, but I am now going to drag another into the equation as I bring up the subject, once again, of The Book Thief by Markus Zusak. Not only because it’s a favourite of mine and the book I shall be giving away 24 copies of for World Book Night on my forthcoming birthday, 23rd April, but also because Death is the narrator in this novel. I love how Zusak has written this novel from the Grim Reaper’s viewpoint, how Death goes about his job of collecting the souls from the deceased and how deeply he is affected by the surrounding survivors, especially as this novel is set in Nazi Germany just before and then during the Second World War. As it says in the blurb on the back of the book, “Death has never been busier”. He admits right at the end of the novel that he is haunted by us humans! However, I have no wish to spoil things for you in case you’ve not read The Book Thief. I heartily recommend it and, as I said, in a matter of just over a week, I shall be giving out copies of this fantastic novel for free! Unlike Liesel Meminger, you won’t even have to resort to book thievery! Well, not if you’re somewhere in the vicinity of the Trafford Centre on Monday 23rd April! I have to stress, though, that this World Book Night event is to try and persuade those who are only light readers, or who don’t really read books at all, to read more books by letting them have one for nowt! I expect I shall get an email some time early on this coming week to notify me that I can collect my box of books for WBN from Waterstone’s in the Trafford Centre, which is my agreed collection point. For now, though, I’m calling it a night on the blogging front. Sorry it’s only short and not one of my epic blogs. I expect I’ll return to form soon enough, but I’ve had a difficult few days and, obviously, the funeral is yet to come. In the meantime I hope those of you who read my blogs are well and I shall end with the usual take care and Happy Reading! Just a fortnight to go now until World Book Night, so this time next week I should be getting an email from WBN to notify me that my box of books can be collected from my chosen pick-up location, that being the Trafford Centre branch of Waterstone’s. 24 special “World Book Night 2012” edition copies of The Book Thief by Markus Zusak will be there in a box awaiting the arrival of yours truly who will show the email on my BlackBerry and thus collect the books I will be giving out on 23rd April. In all probability, I will be giving out my books at the Trafford Centre and maybe in Waterstone’s, although I was thinking I might venture around the Orient dining area with the cafes, restaurants and food court – some people like to read a good book while they’re having a drink and a bite to eat. I have to say I speak from experience, as I have often been known to combine eating and reading – that is probably my favourite kind of multitasking, lol! While I was in Waterstone’s earlier this evening, I was able to help another bookworm, and for this I should give some credit to a book I read last summer. If you cast your mind back to my bloggings from August and September of 2011, (see my blog entry of September 13th 2011) you may recall me reading a book called Tolstoy And The Purple Chair by Nina Sankovitch, which was essentially the lady’s project of reading a book each day for a year as she mourned the death of her sister who’d died of cancer. One of the many books Nina read was one that I had read for my Waterstone’s book club a couple of years ago, The Other Hand by Chris Cleave, but Nina knew it as Little Bee. This is because, for some strange reason, the book was known as Little Bee in the USA and also New Zealand, despite the fact it was called The Other Hand throughout the rest of the English-reading world! The fellow bookworm at Waterstone’s this evening was stood in the area of A-Z General Fiction and near to where Chris Cleave’s novels were stocked. The Other Hand was on the shelves and she was holding a copy of Incendiary. She was on the phone at first, but when she’d finished her call, I said that I’d not read Incendiary but had really enjoyed The Other Hand when I read it a couple of years ago for my book club, and it was then that she replied that she was looking for Little Bee! Thanks to what I know from the Sankovitch book, I was able to tell her that The Other Hand is the same book as Little Bee and that it just has that title in the USA and New Zealand. As I blogged at the time, I still feel this is totally unnecessary and can’t see why they can’t just have the same title for the same language throughout the world. And from those who are proud of being ignorant and thick, we move on to the other extreme of the literary spectrum, those who are stuck-up and judgemental regarding what they feel everyone else should or shouldn’t read, as we return to the matter I was blogging about previously and the issue of literary snobbery! You will recall that I was agreeing with my fellow blogger, R.H. Culp who took umbrage with Joel Stein in the New York Times who had a problem with adults reading “Young Adult” fiction on public transport. I basically lambasted Mr Stein for being a miserable book dictator and pointed out he had no right to criticise adults for their choice of reading matter. Better that as many people as possible read as many books as they can, and enjoy doing so, than people not reading books at all! While I was in Waterstone’s earlier this evening, I had a look at the Young Adult section, seeing which books Waterstone’s regarded as teenage reading matter. OK, there’s some light, frothy stuff, but then again you get that in adult general fiction. Most chick-lit books are fairly light reads about shopping and diets, aren’t they? And then there are your Jackie Collins and Jilly Cooper novels, mostly concerning well-to-do ladies aiming to get in bed with some hunky polo player or other! Not exactly Dickens or Dostoyevsky, is it? But it’s still adult fiction and it persuades some people to pick up a book who might not otherwise do so, therefore it’s a good thing. Anyway, besides the teen equivalent of chick lit, you may also find some weightier matters! Dystopian novels, such as The Hunger Games trilogy, are hugely popular amongst teen readers, and as well as futuristic novels such as those, there’s also some notable works of historical fiction such as The Boy In The Striped Pyjamas or Between Shades of Gray, which deal with characters in concentration camps or Soviet gulags during and after World War II. Regarding the latter of those novels, the author, Ruta Sepetys, is an American-Lithuanian whose family and their friends and neighbours were diabolically-treated during and after WWII by the NKVD, forerunners to the KGB. Between Shades of Gray centres on a 15 year old Lithuanian girl who, along with her family, is rounded up and packed off to a Siberian labour camp basically on the whim of Stalin’s government. Even when survivors of these camps made it back to their original home towns, they were still treated horrendously but couldn’t complain at risk of being sent back to Siberia. Only in the past 20 or so years, since the Soviet Union ceased to exist at the end of 1991, have these horrific stories come to light. Indeed, at the end of the novel, we find construction workers in 1995 Lithuania discovering a “time capsule” buried by the novel’s protagonist, Lina, in 1954 at a time when she was still taking a huge risk with her actions. Yes, Mr Stein of the New York Times, that novel which I have just been describing is classed as a Young Adult novel. But are you seriously going to criticise any older adults who are reading novels of this nature?! I have seen some books split between general fiction and young adult fiction with copies in both sections, including The Boy In The Striped Pyjamas and also my World Book Night choice, The Book Thief! I checked at Waterstone’s in the Trafford Centre and they had copies of Zusak’s novel in both sections! Quite right too! I’m glad these books appeal to readers young(ish) and old alike and that, therefore, as many readers as possible will try to ensure that such horrific and inhumane incidents in our history are never repeated. Also, the fact of the matter is that some of these books have only been published in the last year or so, The Book Thief was published some time in the past decade and Between Shades Of Gray was only published last year. It’s not my bloody fault I was already well into my adult years before these books existed! Also, a story like that in Between Shades of Gray could not even really have been written before the mid 1990s at the earliest due to the whole historical background upon which the novel is based! We’re talking about people packed off to gulags in the 1940s. For those fortunate enough to have survived and returned home, they wouldn’t have done so for at least another decade or so. The main protagonist, Lina, had managed to return to her home town by 1954 as we find out from the time capsule. Even then, she, her husband and all their fellow survivors would not have been able to talk about the experience freely until 1991 when the USSR ceased to exist and the Baltic states of Latvia, Lithuania and Estonia gained their independence. Well, back over here in the UK, I was celebrating my 18th birthday and the start of my adult life in the April of that very year! Plus you then need to add on a few more years into the mid 1990s for the epilogue of the novel where the Lithuanian construction workers, building new properties in their recently-independent country, discover the time capsules that their brave compatriots had buried back in the 1950s in the hope they’d be found in years to come by sympathetic people who would make their story heard widely. While I guess someone could have written a story like that of The Book Thief when I was a teenager myself back in the 1980s, there is no way the Sepetys novel could’ve been written any earlier than around 1996. As I said in my previous blog entry, I’ll read what I want and to hell with the book snobs! Then again, I have a Kindle. E-book devices such as these are absolute godsends for those of us bookworms who travel by public transport! Not only because it means we can have hundreds of books to choose from and all stored on one device, but it also means that, unless he or she is sat directly behind you and being especially nosey, the Book Snob does not know which of countless books you are actually reading on your device! Therefore, e-readers give you a bloody good opportunity to indulge in some “teen” fiction, such as I’d Tell You I Love You, But Then I’d Have To Kill You without any would-be literary dictators knowing anything about your reading habits! I think that’s about all for now, you’ll be relieved to discover! Until next time, Happy Reading and don’t let the book snobs get you down!